First of all, thank you to EVERYONE for your lovely messages and congrats! I will admit it was a bit of a surprise, and more of a surprise that it's yet another boy!! But we are all really happy and can't wait until he arrives (I don't know what is worse though, me having to go through the not sleeping thing for around another 140 sleeps, or Maeve asking 5 times a day how many more sleeps until the baby is born!??!). But, today's excitement? My new nappy bag is here!!!!! I have coveted one of these since Elsie bought one in Europe last year (she uses hers as a normal handbag though). When I found out I was pregnant, I KNEW that it was the nappy bag I wanted!!! After a huge search, and the discovery that they are old season and really hard to get, I tracked them down on Ebay. I was debating over the pink vs blue, but the decision was made when I was too late to bid on the pink. So blue it was! And wouldn't you know it, so was the baby!!! Totally in lurve... Yeah, I know, its the little things! Congrats on your surprise, I am pregnant too, don't know if it is a boy or a girl yet but OMG I have to have one of those nappy bags too, so cute! I love your blog, gave you a link on mine, yay! Oh yeah your bag is so cool. And not long to go now for Baby Blue. It seems ages since Senz in CHch and you tolds you were having a baby. Not sure if you will remember me but I visited your blog and left comments a couple of times during 2007. I noticed you haven't updated your blog in a while. I hope your all keeping well and 2008 is running smoothly for you. Found your blog from Kelly Lautenbach's. She posted a photo of your felt circles on her blog. I am inlove with your designs. Beautiful!!!!!!! Congrats !!! I love that bag !! Belated Congrats from me too! Congratulatons! 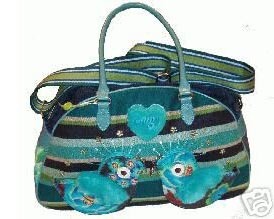 I remember Elsie's bag, very very cute! Congratulations K! Haven't been to your blog for a while but got the nicest suprise to see you are having another little bubby! Not sure if you will remember me but I visited your blog a couple of times during 2007. I wanted to come by again and wish you and your family a very Happy and Safe New Year. May 2008 bring you lots of fun, happiness, good health and success. How can I find that purse?? OMG kerrin...that bag is too cute for words. and if you ever lose one of the kids in a shopping centre they can describe you as "the cool mum with the coolest nappy bag over her shoulder". many congrats AGAIN to you, mik and the whole family - i am still smiling when i think of your news. and i am counting down the sleeps too until your little guy makes his appearence. TOO CUTE!!! I love that bag. You could make an 'event' calendar for Maeve! NOT! Maybe - do it with weeks rather than days. Congrats to the Qualls. Now the real reason why you don't want to scrap is revealed. LOL. Enjoy the bag. You deserve it. I don't blame Elsie for using it as a handbag, I think I would too - I love it. ooooh, aaaaah...it is beautiful, but not enough to make me want another bub. Maeve's backward counting will be awesome by the time this little man arrives;). Your news still brings a smile to my dial.